• Authentic U.S. Bicentennial 1976 Quarter. Here is your chance to own a lot of three (3) 24KT Gold Plated Bicentennial 1976 Quarters U.S. coins. Each coin is 24KT Gold Plated by the Merrick Mint to highlight the original design using a unique authentic process. The result is an everlasting 24KT Gold Plated coin collectible of ultra-high quality that is #1 in the industry. Each Bicentennial coin features the left portrait of George Washington design on the obverse and Colonial drummer design on the reverse. 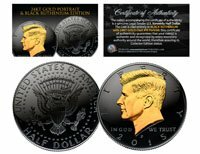 Each coin is genuine legal tender of the United States and comes in a premium coin capsule. Each coin comes with a full color 2-sided Certificate of Authenticity to guaranty that your coin is authentic and recognized by every monetary authority around the world, assuring its Collector Edition status. The Quarter is a U.S. twenty-five cent coin with coin mint marks chosen at random.